Today the Carmel of Lisieux finished publishing online in English all the surviving letters St. Therese's sister, Leonie Martin, wrote to the members of her family. The letters are available at the Web site of the Archives of the Carmel of Lisieux. Leonie, then aged 10, wrote the first surviving letter to her mother in 1874, when she was at the boarding school run by the Visitation nuns at Le Mans. 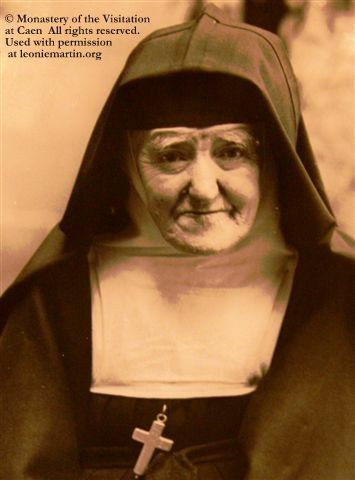 She wrote the last on June 8, 1941, eight days before her death, to Sister Marie of the Trinity, who had been a novice of St. Therese. Relatively few of the letters Leonie wrote during the lifetime of St. Therese have survived. But the Carmel has today published a treasure trove of her later years: 315 letters Leonie wrote to her family after she entered the Visitation in 1899. Most of them are to her three sisters at Lisieux Carmel (Sister Marie of the Sacred Heart; Mother Agnes of Jesus; and Sister Genevieve of the Holy Face). Several are to her uncle, Isidore Guerin. There are also letters to his wife, Celine Guerin; to their daughter Marie (Sister Marie of the Eucharist); and to Therese's prioress, Mother Marie de Gonzague. These hundreds of letters, never before published in English, contain invaluable insight into Leonie's personality; her spirituality, prayer, and retreats; her daily life and the life of her Visitation community; her relationships with her three sisters in the Carmel; her reaction to Therese's beatification and canonization; and her response to World War I and World War II. We congratulate the Carmel of Lisieux and the Association des Amis de Thérèse de Lisieux et de son Carmel on this historic achievement, and we thank them for their generosity. You will not be able to absorb all these riches at one sitting, so begin! Dive into Leonie's letters now.